FRC Team 5145 Trip to St. Louis! The first video above shows our pit setup on Wednesday night. It took a few hours, but I have it condensed to about 20 seconds for your enjoyment. Below is the trip from Gainesville, Florida to St. Louis, Missouri. We had a motor coach to drive us (thank goodness!) for the 13 hour drive. Now everyone wants to know what the robot looked like, so below is a picture of our bot. I am super proud to say that it was all design, built, programmed, and operated by the students. When things went wrong, the team sprang into action and did an amazing job of fixing the bot. It was an excellent learning experience and I am looking for ward to the next season! 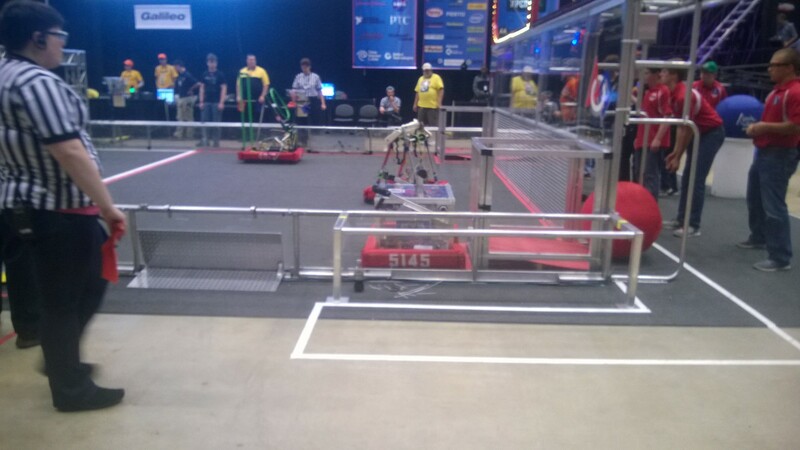 Finally, if you want to stay up with the latest from Team 5145, check them out on Twitter @WolfBotics! My latest upgrade is adding some more torque to the cargo bay doors so they can close from any angle. Many of us forget that much of physical actions we see the space shuttle do in space cannot be reproduced in the gravity of Earth. Even with LEGO, this model pushes the limits of what is actually possible. The image also gives you a rather good look at what is actually going on inside the nose. Many people dont see the mechanical drive behind each function. For your reference, the motor that is parallel to your line of sight drives the port cargo bay door, the motor horizontal in the image drives the starboard cargo bay door. The two motors that are in the background actually drive the Canadarm. All this fits into the nose of the shuttle and is hidden by the Techinc skin of the model. Should you be in the Austin area and want to see the model, there is a special “Texas Day” at NIWeek. See ni.com for more information. The next scheduled appearance of shuttle is at Brickworld Fort Wayne in October. LMS Shuttle on the LEGO Club Website! LEGO Club decided to do a rather nice piece on the shuttle. The theme of the LEGO Club’s website this month is the end of the shuttle era. The July 8th launch of Space Shuttle Atlantis marked the 135th and final launch of NASA’s Space Shuttle program. 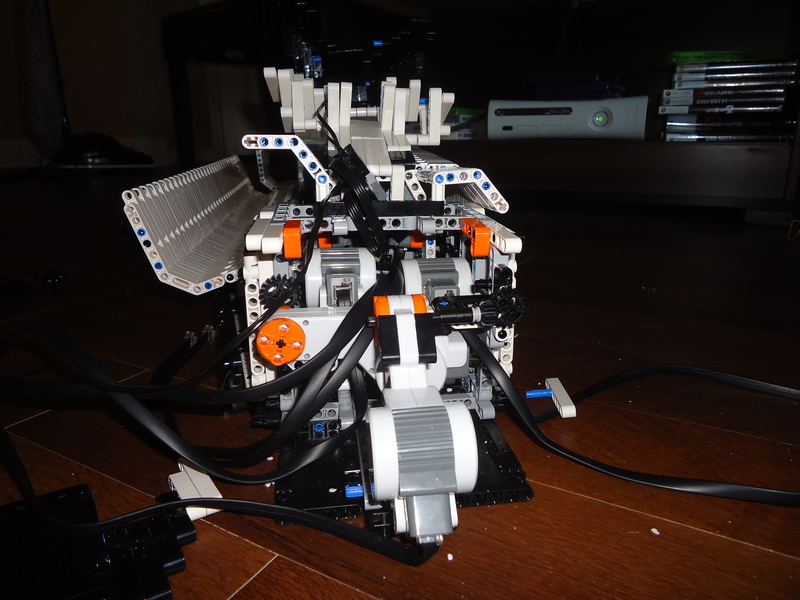 As a tribute, Marc, John and myself created a LEGO MINDSTORMS model. The model went public on April 12, 2011: the 30th anniversary of start of the shuttle program and the 50th anniversary of human space flight. LEGO Club contacted me a few months ago for some stats and pictures from the construction and first few events. They included theses images as well as a nice write up on the shuttle in their article. You can find the article here! 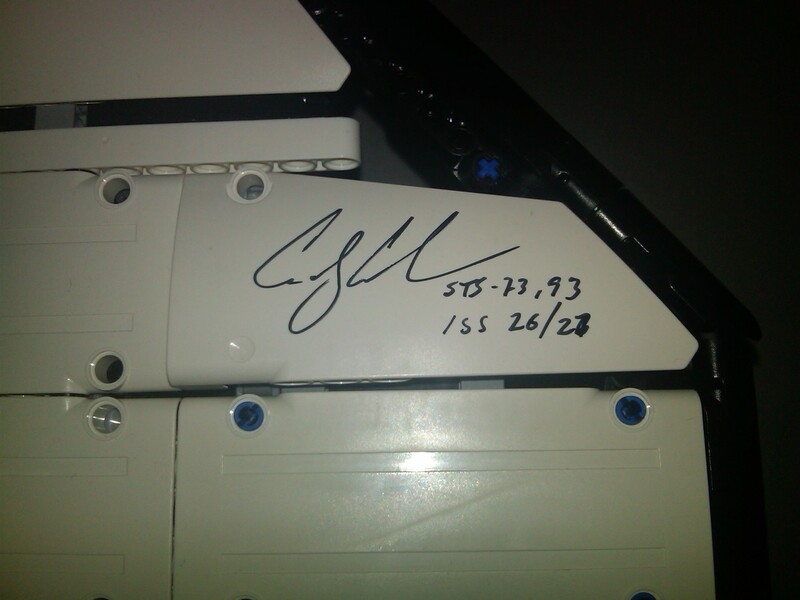 Tony Antonelli (Pilot STS 119 and 132) stopped by and added to the signatures from Cady Coleman (Mission Specialist STS 73 and 93 and Expedition 26/27 crew)! Tony stuck around for almost two hours answering questions, building, and signing autographs. 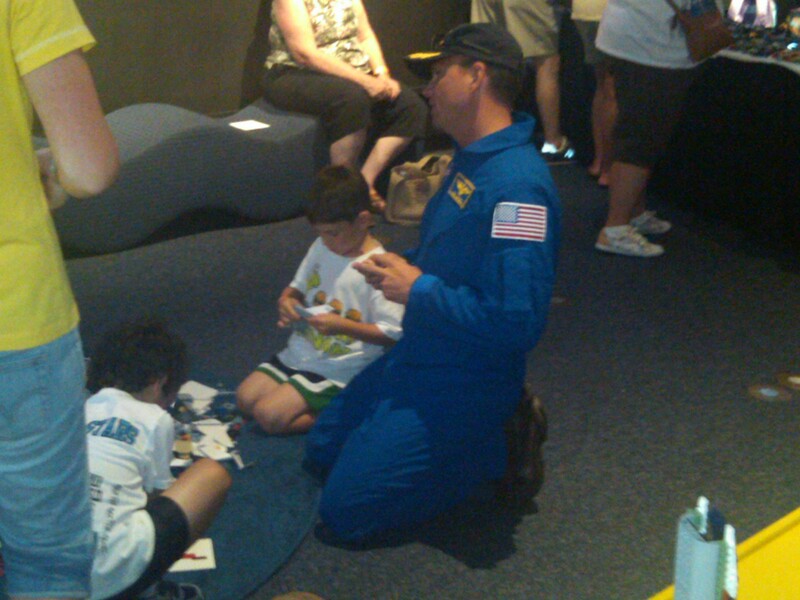 After a successful launch, how better to celebrate then with an astronaut! The LMS Shuttle is truly an interactive monument to all the hard work and dedication of the crews of the Space Shuttle Program. 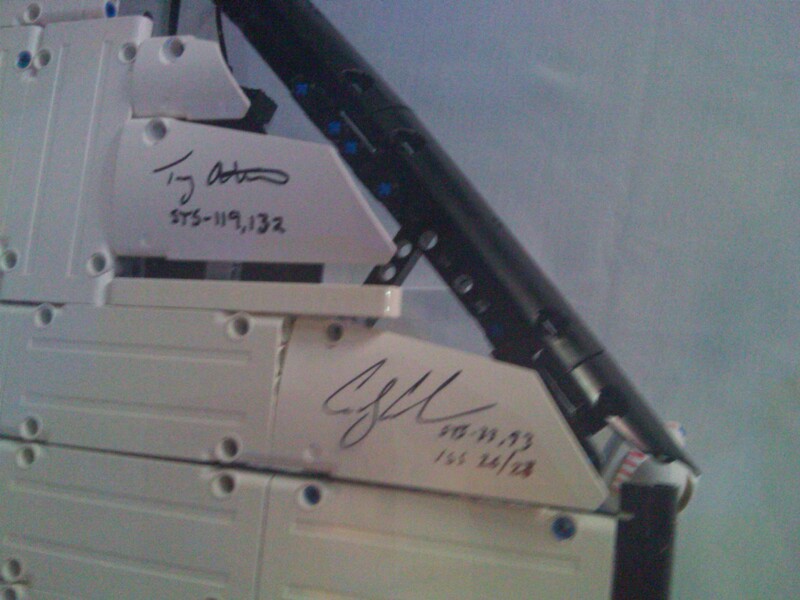 I invite all astronauts to sign a panel and leave your mark on this robot. Tony spent 1.5 hours just hanging out with us and building with the kids! What a cool guy! The shuttle will be appearing later this month at Johnson Space Center in Houston, Texas. Stay tuned for exact date and time. For now, the shuttle is packed up and on its way to Texas for upgrades and bug fixes. Pictures will be uploaded to its facebook page from the trip. Joe Meno also helped me make an exclusive video that should be posted in the next few days! While shooting the video, the shuttle attracted quite a crowd. Lots of pictures and questions. I am glad this project is inspiring others to shoot for the stars! Back in October 2010 I was in Zwolle, The Netherlands talking with some friends about our NXT LEGO Project. We discussed many ideas, but one stuck out. 2011 was to be the end of the Space Shuttle program; a program that provided much of the technology for LEGO MINDSTORMS. So how to give back? Leveraging our talents, we began to flush out the idea for a BIG model. Come January, we began to work on the LMS Space Shuttle. The project was a team effort by John Brost and me representing America, Marc-Andre Bazergui representing Canada, and The LEGO Group in Billund, Denmark. Over the next 4 months, we constructed the shuttle from about 8,000 parts. Marc-Andre built an amazing robotic arm (fitting since he is Canadian). John build a stand that could rock the 5 kilogram orbiter 30 degrees side to side. I worked on the main orbiter body. With little more than pictures to go by, I build an interactive orbiter. The shuttle has 11 motors and 12 sensors giving the user control of the arm, flaps, rudder, ailerons, cargo doors, and roll of the orbiter. The forward and rear thrusters also can light up! There are 2 remotes and 4 control NXTs. The NXTs link over Bluetooth and RS485. HiTechnic accelerometers and gyroscopes track the movement of the orbiter to keep the system well in control, while touch, light and ultrasonic sensors ensure the machine will not damage itself. The shuttle debuted on the April 12, 2011: the 30th anniversary of the Space Shuttle and the 50th anniversary of manned space flight. That following Saturday, the model was on hand at Yuri’s Night at NASA Langley Research Center. Since then, the model has been to FIRST World Championship in St. Louis, Brickworld Chicago, and schools all over the midwest. Currently the model is on display at Kennedy Space Center for the launch of STS-135 and shuttle Atlantis. Following the launch, the shuttle will travel to Texas where it will visit Johnson Space Center and be a featured demo at National Instrument’s NIWeek in August. Like the real shuttle, the LEGO MINDSTORMS Space Shuttle has spawned some innovations of its own. The most famous of which is the first NXT-G RS485 block. This block (and supporting LabVIEW VIs) are what permits inter-brick communication for the running of orbiter systems. This new technology has already been leveraged by people all over the world for everything from a Masters Thesis to Wall-E 5. It has been a lot of fun to work on such a large, complex project. I cant wait for the next one!